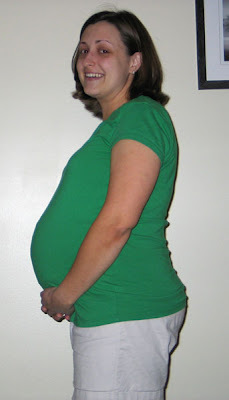 Well, here I am at 33 weeks. If you compare it to my 30 weeks shot (click on the Belly Shots link at the end of the post) you can see that this baby girl is starting to REALLY pop out. I'm definitely feeling it too - no more sleeping through the night for me - the bathroom calls. But honestly, I feel lucky that I've made it this far w/o having to wake up - unless it was for one of my non-uterus bound children. I'm also noticing that rolling over in bed is getting to be more difficult and I have to kind of wake up to readjust, but again, that's just par for the course. Heartburn is managable this time - probably the least I've ever had with all my pregnancies. Not that I don't have a bad day or two, but it's not constant like it was with Caroline. Also, the baby isn't laying too low yet either which means I don't have any pelvic/hip pain yet, so I'm counting my lucky stars on that one too. I know it's coming - I'm not dumb, I'm just enjoying the good days while I have them. My biggest complaint right now would have to be tiredness. My iron levels were okay a few weeks ago so I know it's just late pregnancy. A diet coke helps get me moving in the morning but by mid-morning, I'm tired again. I left work a little early this afternoon and had the luxury of laying down for an hour before the kids got home and boy, did that make a difference in my evening. I still had a little bit of pep to play with them and manage them while Jason mowed the yard. So likely less than 6 weeks to go if we're still going for an induction sometime during the 39th week. There's so much I still need to do at work too - I need to make a list b/c I need to teach people a bunch of stuff so it doesn't get screwed up in my absence. I better get cracking b/c while I highly doubt I'll go into labor before then, I also know that you just never know. Wonder if I should think about packing a bag too? This post brings back memories from last year! I was ready for baby to born after June 1st. Pack your bags just in case!